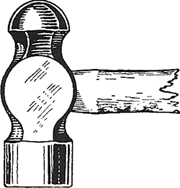 A hammer having a hemispherical peen. When you are ready, some of the tools you will need are safety mask and glasses, assembly/disassembly books and schematics, vise with padded jaws, pin vise, ball peen hammer, files with safe edges, needle files, screwdrivers and punches, abrasive cloth in 80-600 grit, 0000 steel wool, oil, Happich Simichrome Metal Polish, Acraglas gel and release agent, wooden dowels and sanding blocks, bench grinder holding a 0. Smash each rivet flat and tight to the replacement blade edge using a ball peen hammer. Tenders are invited for Ball Peen Hammer 500 Grams. HIT one side of the nut with a cold chisel and ball peen hammer. Tenders are invited for 1 Lb Ball Peen Hammer And Another End Flat With One Feet Wooden Handle.